Jack Simonds scores 31 points and keys a 10-0 surge to lift the Bowdoin men's basketball team past Husson. BRUNSWICK — Jack Simonds scored 31 points, including eight during a 10-0 run early in the second half, as Bowdoin raced to a 78-60 win over Husson on Tuesday in a non-conference men’s basketball game at Morrell Gymnasium. Simonds helped Bowdoin (14-8) take a 49-35 lead with 13:59 remaining after Husson had cut the lead to four on a 3-pointer from DJ Bussey. Simonds finished 12 of 18 from the field, including four 3-pointers, while Hugh O’Neil added 12 points and 14 rebounds. Bussey scored 17 points for Husson (13-9). ENDICOTT 128, UNIVERSITY OF NEW ENGLAND 79: Keith Brown scored 35 points, going 8 of 11 from long range, as the Gulls (16-6,9-4 CCC) shot 61.5 percent on 3-pointers and rolled past the Nor’easters (6-17, 4-10) at Beverly, Massachusetts. Matt McDevitt added 23 for Endicott, while reserve Vinny Clifford chipped in with 11. Drew Patno led the way for UNE with 13 points. COLBY-SAWYER 96, ST. JOSEPH’S 94: Dana Bean sank a pair of free throws with three seconds left in regulation to cap a 6-0 run as the Chargers (12-10, 6-3 GNAC) rallied past the Monks (15-7,5-4) at New London, Connecticut. Jack Casale scored 31 points for St. Joseph’s, Darian Berry added 27 points and Ian Miliekis 18. BATES 73, MAINE-FARMINGTON 65: Trailing 41-35 early in the second half, the Bobcats (7-15) used a 14-0 run to take control in a win over the Beavers (15-7) in Lewiston. Nick Lynch had 16 points and 10 rebounds for Bates, Kody Greenhalgh also had 16 points, while Tom Coyne added 12 points and Nick Gilpin had 10. Bill Ruby had 27 points for UMaine-Farmington. 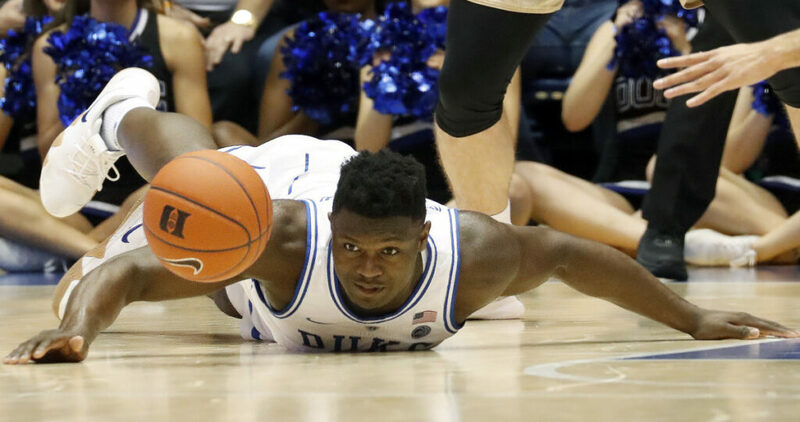 (2) DUKE 80, BOSTON COLLEGE 55: Freshman Cameron Reddish scored 24 points, and Duke (20-2, 8-1 ACC) pulled away to beat Boston College (11-10, 2-7) at Durham, N.C.
Zion Williamson had 16 points and a season-best 17 rebounds, RJ Barrett finished with 19 points and Tre Jones added 11 points for the Blue Devils. (5) KENTUCKY 76, SOUTH CAROLINA 48: PJ Washington scored 20 points, and Kentucky (19-3, 8-1 SEC) routed South Carolina (11-11, 6-3) at Lexington, Kentucky, for its ninth consecutive victory. Washington fell short of his fourth consecutive double-double but posted his fourth 20-point game in the past five. Tyler Herro, Reid Travis each added 11 points for the Wildcats. ILLINOIS 79, (9) MICHIGAN STATE: 74: Ayo Dosunmu scored 24 points, and Illinois (8-15, 4-9 Big Ten) used a swarming defense to upset visiting Michigan State (18-5, 9-3). Giorgi Bezhanishvili scored 16 for Illinois, and Trent Frazier added 15 as the Illini handed the Spartans their third straight loss. UNIVERSITY OF NEW ENGLAND 55, ENDICOTT 52: The Nor’easters (12-11, 10-4 Commonwealth Coast) closed on an 11-0 run, highlighted by back-to-back 3-pointers from Sadie Nelson, and rallied past the Gulls (15-7, 11-2) at Beverly, Massachusetts. Nelson finished with 12 points and six rebounds for UNE. Allie Goodman added 12 points. Emily Pratt scored 17 points for Endicott. BATES 68, HUSSON 44: The Bobcats (12-10) started the second quarter on a 12-2 run, opened a 32-20 halftime lead and cruised by the host Eagles (15-7) in non-conference action at Bangor. Erika Lamere had 16 for Bates, while Ariana Dalia had 12 points and Meghan Graff added 11. COLBY 72, MAINE-FARMINGTON 45: Keegan Dunbar scored 19 of her game-high 22 points in the first half as the Mules (10-12) opened a 34-24 halftime advantage and pulled away from the Beavers (5-17) to earn a non-conference game at Farmington. SOUTHERN MAINE 2, PLYMOUTH STATE 0: Shannon Douglas scored an unassisted goal for the Huskies (8-10-6, 5-6-4 New England Hockey) midway through the first period in a win over the Panthers (6-14-3, 4-7-3) at Gorham. Amanda Piknick added an insurance goal from Brianna Doty in the third period for Southern Maine. Emelie Lindqvist made 22 saves for Plymouth State, while Britney Evangelista turned aside all 34 shots she faced in net for the Huskies.